The Cocker Spaniel, also called the American Cocker Spaniel, is the world's most popular household pet. The smallest of the sporting dogs, the Cocker Spaniel has a sturdy and compact body. This affectionate and friendly dog breed loves human companionship. The Cocker Spaniel originated in the U.S. Male Cocker Spaniels range from 14.5 inches to 15.5 inches. Female Cocker Spaniels range from 13.5 inches to 14.5 inches. Cocker Spaniels range from 24 to 28 pounds. Cocker Spaniels can be any solid color or parti-color (one of which has to be white) coats. The Cocker Spaniel has a silky coat, which can be flat or slightly wavy. Brushing twice a week is recommended to keep its coat from matting and odor free. Cocker Spaniels are lovable family dogs. Playful and sweet, Cocker Spaniels are very eager to please their owners. 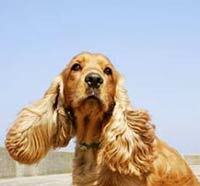 Cocker Spaniel are susceptible to ear infections, eye problems, hip dysplasia and epilepsy. The expected life span of the Cocker Spaniel is 12-15 years. Cocker Spaniels adapt well to any kind of environment and setting, just as long as they get sufficient amounts of exercise. A long daily walk is good exercise for the Cocker Spaniel. The Cocker Spaniel is in the sporting group. Long silky hair, floppy ears, short tail that always seems to be wagging, eyes begging for you to play with him. Could we be talking about anything other than a Cocker Spaniel? Cocker Spaniels were named for their skill at flushing out the woodcock game bird. Originally bred in England as a gun dog, the breed was brought to North America in the late 1800’s. 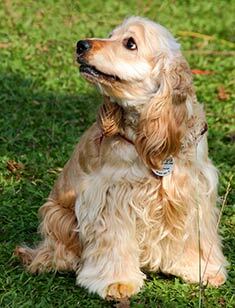 Over the years, the breeds diverged and became different enough that the English Cocker is now considered a distinct breed from the American Cocker. The key difference lies in the coat. American Cockers have long, silky, wavy hair, while English Cockers have a rougher, curlier coat. Perhaps less obviously, American Cockers may weigh a bit less than English Cockers, the former averaging 15 – 30 pounds and the latter weighing in at 28 – 34 pounds. The remainder of this article will deal with the American variety. The American Kennel Club recognizes three color classes for Cockers: black, any solid color other than black (ASCOB), and parti-color. Black Cockers may be solid black, or may have black and tan coloring similar to a Rottweiler. ASCOB colors include the full range from light buff to brown to dark red. Parti-color dogs are primarily white, but at least 10% of their body is black, brown, or tan. Show dogs’ coats are kept long, to the point where the fur touches the ground. However, most non-show dogs are clipped to provide ease of grooming. The most distinguishing features of a Cocker are the long, silky ears. Remember Lady from Lady and the Tramp? The long ears give the breed a definitely feminine aura, even in the males. Although beautiful, these long ears can cause these dogs to suffer from frequent ear infections. The long, floppy ears trap moisture, creating a perfect environment for yeast and fungi growth. Keeping the dog indoors most of the time will help to prevent this painful problem. In addition, the ears must be cleaned weekly. Very friendly, the breed loves lots of companionship. In fact, many Cockers are named Shadow because they stick to you wherever you go. However, the downside to this social behavior is that separation anxiety is often a problem. 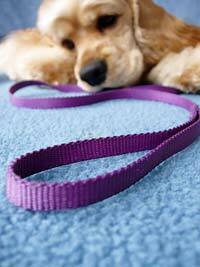 Left alone, the dog may become depressed or anxious and destructive. Separation anxiety is difficult to deal with, but you can try leaving the dog a piece of clothing or a bath towel with your scent on it to ease his fears. Crating a dog suffering from separation anxiety may save your sanity. Finally, there are medications available that can calm your dog when you are going to be away. Cocker Spaniels need lots of love. Be sure to exercise your Cocker Spaniel regularly. Cocker Spaniels often have problems with their eyes, resulting in cataracts and glaucoma. Just as in humans, cataracts in dogs are a film which forms over the lens of the eye. The lens is important in focusing light on the retina by flexing to pull objects into focus regardless of whether they are near and far away. When proteins in the lens clump together, they form a cloudy film causing blurred or hazy vision. The cause of cataracts is not known, although it is thought that exposure to ultraviolet radiation may contribute to their formation. Diabetic dogs are at greater risk of developing cataracts and should have their eyes checked regularly. The only treatment for cataracts is replacement of the lens. Glaucoma is a loss of vision associated with damage to the optic nerve. This nerve connects the eyeballs to the brain, enabling the dog to see. When the nerve becomes damaged, blindness follows, although medication can slow the progression of the disease. The exact cause of glaucoma is unknown, but dogs that are nearsighted or suffer from diabetes or high blood pressure are at greater risk. Another disease that Cocker Spaniels are prone to develop is Autoimmune Hemolytic Anemia, or AIHA. Cocker spaniels have a predisposition for autoimmune hemolytic anemia (AIHA). In this condition, the dog’s immune system attacks his own blood cells. The cause is unknown, but may be associated with lupus, bacterial infections, medications or vaccines. A dog with AIHA will have pale gums and will be fatigued. In addition, he may have an enlarged liver, which you would notice by swelling of the belly. AIHA is treated with steroids and chemotherapy drugs. Don’t let these health warnings scare you off of the breed. They are not terribly common and can all be treated. Cockers are still great dogs, friendly companions, and hard workers, whether on the hunt or in the show ring. If you’re looking for a small dog that will be a loyal friend, the Cocker Spaniel may just be the right breed for you! Find Cocker Spaniel (American) Puppies with our Free Breeder search!